2017 was a rough year for tropical rainforests, but there were some bright spots. 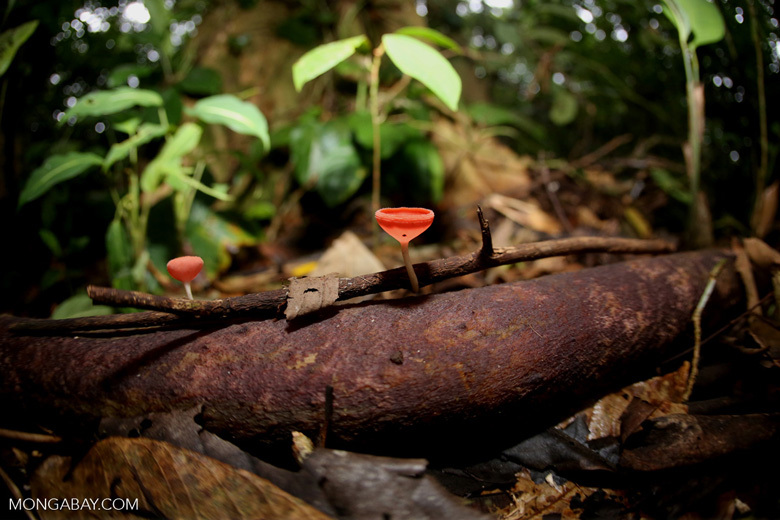 This Mongabay’s annual year-in-review on what happened in the world of tropical rainforests. Here we summarize some of the more notable developments and trends for tropical forests in 2017. Between America’s abandonment of leadership on conservation and environmental policy, Brazil’s backtracking on forest conservation, massive forest fires worldwide, and the revelation of a sharp increase in global forest loss in 2016, 2017 was a rough year for tropical rainforests. Still, there were bright spots, including the establishment of new protected areas, better forest monitoring and research, and continued progress in recognizing the critical role local and indigenous communities play in forest conservation. The following is a short review of some of the more notable developments and trends for tropical forests in 2017. This review is not exhaustive, so feel free to add developments we missed via the comment function at the bottom. 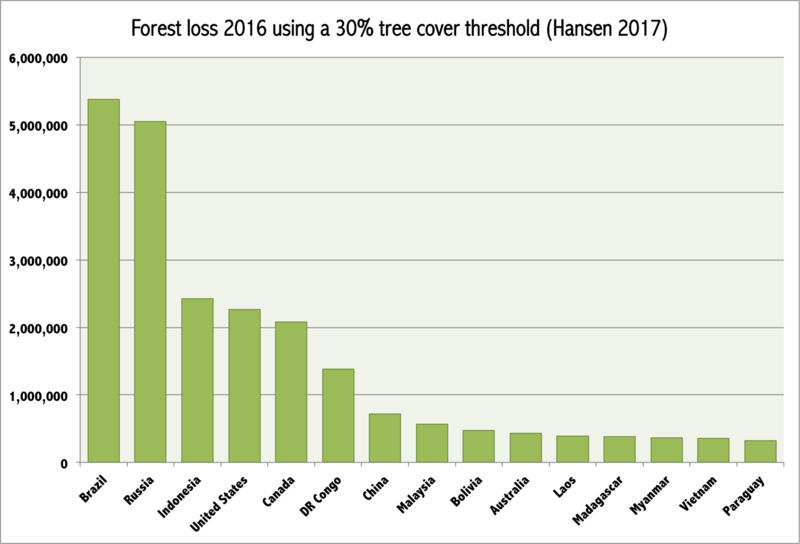 As reported in Mongabay’s last year-end review, there wasn’t a major update on global forest loss in 2016. In 2017 however, we got updates for both 2015 and 2016, and the numbers weren’t pretty: last year global forest loss hit the highest level on record (the dataset goes back to 2000). While much of that “loss” — which includes all tree cover loss, ranging from deforestation to harvesting of plantations to instances where blocks of forests have lost all their leaves from, for example, fire and beetle infestation — occurred outside the tropics, Brazil, Indonesia, the Democratic Republic of the Congo, Malaysia, Bolivia and Laos made the top 10 list for 2016 in terms of loss of dense tree cover. Analysis suggests that tree cover loss in the tropics may have been higher than normal in 2016 due to fire. Brazil and Indonesia were both particularly hard hit by drought and fire during the 2015 El Niño, which would have shown up in satellite data in 2016. The continuation of severe fires in the tropics in 2017 — Brazil, Indonesia and Guatemala, for example — suggests the past 12 months will go down as another year of high forest cover loss. 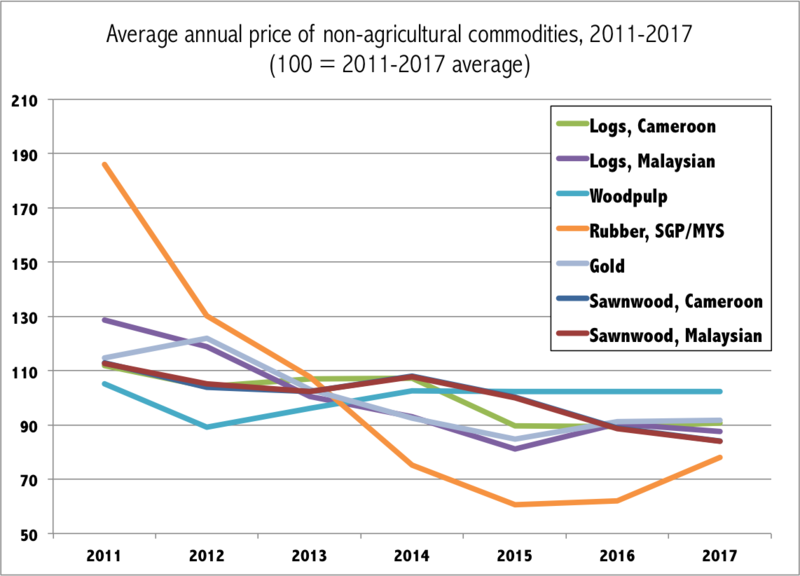 Commodity production is the biggest direct driver of tropical deforestation, so commodity prices are an important factor in deforestation trends. 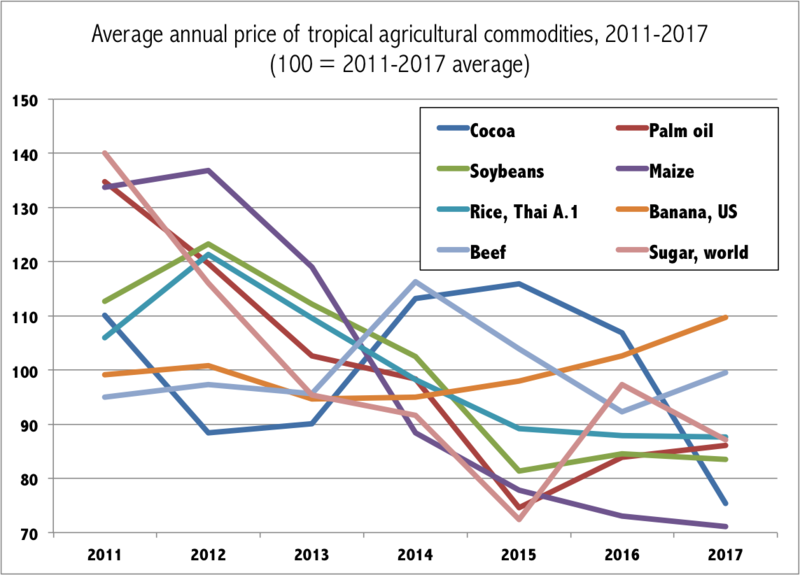 In 2017, prices of commodities most commonly linked to deforestation in the tropics were generally flat in dollar terms, with the exception of rubber, which rose by about a quarter, and cocoa, which fell nearly 30 percent. Energy and metals prices increased modestly over 2016. Adoption of commodity sourcing safeguards is often associated with falling commodity prices, which give buyers leverage for extracting concessions from suppliers. Continuing in that trend, in November the governments of Ghana and Côte d’Ivoire said they would take action to address deforestation for cocoa production. Companies continued to make and strengthen No Deforestation, No Peat conversion, No Exploitation (NDPE) commitments, but some NGOs expressed concern about progress. For example, the Global Canopy Programme (GCP) said in its annual “Forest 500” report that less than a quarter of the companies assessed had extended zero deforestation policies to cover all of the commodities in their supply chains. GCP called out banks as laggards on zero deforestation, echoing campaigns that targeted financial institutions like HSBC and pension funds, which underwrite deforestation by lending to, and investing in, plantation and logging companies. A report from the Zoological Society of London (ZSL) noted that some publicly traded companies aren’t disclosing the full extent of their “landbanks,” making it harder to determine whether they are abiding by their sustainability commitments. Some prominent companies that have signed NDPE agreements said they need more help from governments to make zero deforestation a reality. Some major companies made headlines for the wrong reasons in 2017. Goodhope Asia Holdings was sanctioned by the Roundtable on Sustainable Palm Oil (RSPO) for environmental and human rights abuses in Indonesia’s Papua region. It subsequently established an NDPE policy. Samsung’s relationship with Korindo, a South Korean conglomerate that has cleared thousands of hectares of Papuan rainforest, made it a target of Mighty Earth, an upstart campaign group that in 2017 also went after Burger King for deforestation in dry forests in Brazil, Bolivia, Paraguay and Argentina, as well as chocolate buyers for forest clearing in West Africa. JBS, the world’s biggest meat company, was sanctioned by Ibama, Brazil’s environmental protection agency, for buying cattle from illegally deforested areas in the Amazon. Pulp and paper giants APRIL and Asia Pulp & Paper (APP) got caught up in scandals that felt like throwbacks to their pre-NDPE days: APRIL for deforestation in Sumatran peatlands as well as transactions documented in the Paradise Papers, and APP for deforestation by allegedly “independent” suppliers that an Associated Press investigation said are actually owned by APP’s parent Sinarmas. An analysis by Brazilian NGO Imazon confirmed the role the cattle business plays in deforestation in the world’s largest rainforest. The study found that 88 percent of deforestation that occurred in the Brazilian Amazon between 2010 and 2015 was within the “zone of influence” of the 128 slaughterhouses that process 93 percent of cattleraised in the region. The findings suggest that slaughterhouses may offer the best leverage point in working to address deforestation in the cattle sector in Brazil. Mining may also be a bigger driver of deforestation than traditionally thought. 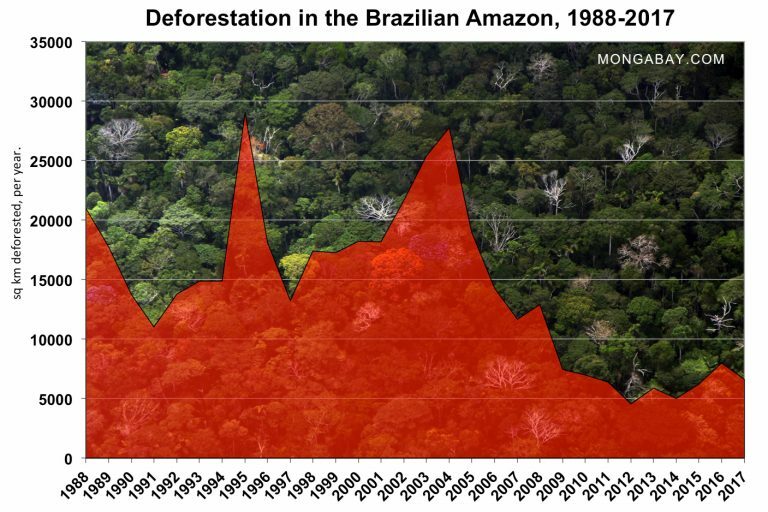 A Nature Communications study estimated that mining caused five to 10 times as much deforestation as previously estimated in the Brazilian Amazon between 2005 and 2015. The researchers incorporated indirect deforestation from mining, including infrastructure built to support mineral extraction and transport, into their estimates, concluding that 11,670 square kilometers (4,500 square miles), an area twice the size of the state of Delaware, of forest loss was attributable to mining during that period. And finally, a paper in Environmental Research Letters highlighted a non-conventional driver of deforestation: money-laundering by narco-traffickers in Central America. The paper said profits from the drug trade are being used to finance agricultural expansion in the region. 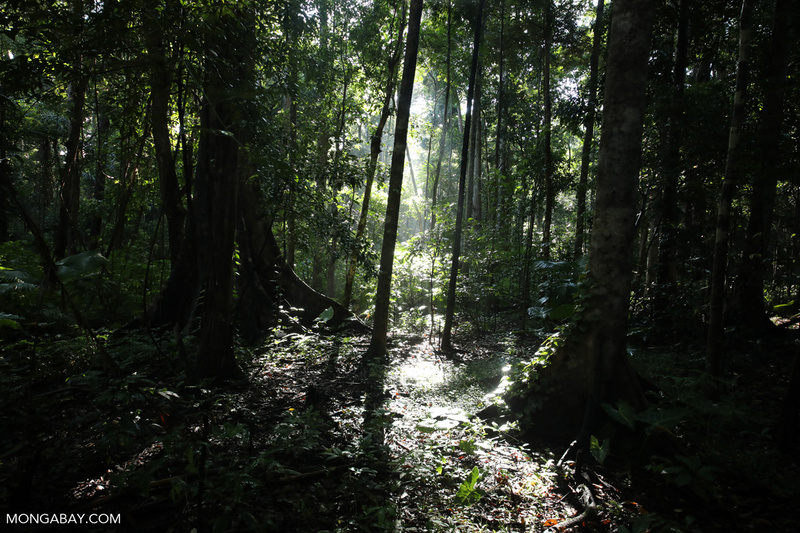 Lowland rainforest in Sulawesi’s Tangkoko Reserve, Indonesia. Photo by Rhett A. Butler for Mongabay. The Forest Stewardship Council, a timber and wood products certification body, held its General Assembly, which takes place every three years. Notably, the assembly passed a motion to allow certification of plantations cleared post-1994. The move — which was opposed by some environmental members of the FSC — would expand certification to countries like Indonesia, where large-scale forest clearance has occurred for plantation development since that date. The body voted down a motion to increase transparency around certified concessions. Two leaders of eco-certification decided to become one. In June, Rainforest Alliance and UTZ announced they would merge to create a single sustainability standard and certification program under the Rainforest Alliance brand. Various parties reached agreement on a methodology for determining what areas should be off-limits for conversion within oil palm concessions. Known as the High Carbon Stock (HCS) Approach Toolkit, the methodology is the product of years of debate between palm oil producers, buyers, traders, and civil society groups. Brazil houses the largest extent of rainforest in the world, most of which lies within the Amazon. Since the early 2000s, Brazil has led the world in setting aside protected areas and indigenous reserves, creating financial incentives for forest conservation, building forest monitoring systems and reducing rainforest loss. As such, the country has been seen by forest giants like Indonesia and the Democratic Republic of the Congo, as well as donor nations like Norway seeking to reduce deforestation and associated emissions, as a model to potentially emulate. But Brazil’s success story started to sputter over the past few years as the costs of the country’s financial and political crisis has started to impact its conservation initiatives. Part of Brazil’s apparent success has been a façade — agricultural expansion in the woody grassland called the cerrado has allowed Brazil to ramp up commodity production, while slowing deforestation in the rainforest biome — but some of it has indeed been real, the product of a combination of policy, law enforcement, monitoring, and activism and pressure from civil society and indigenous peoples. In 2017, Brazil seemed to backtrack on recent progress, with President Temer leading a rollback of environmental protections, including reducing conservation areas, targeting indigenous land rights, cutting budgets for monitoring and enforcement, and granting amnesty for environmental crimes. Many of Temer’s initiatives were blocked by courts, public prosecutors, or public outcry. Things looked so bad at one point that Norway, which has put hundreds of millions of dollars into Brazil’s coffers for forest conservation, took the unusual step of condemning Temer’s plan to remove a vast swath of land from conservation areas. The government was also ineffective in stemming violence against environmental, indigenous and land rights reform advocates. More than 60 were killed through the first 10 months of 2017. While the broad trend in Brazil was bad news for its forests, there were moments of elation for environmentalists, including the creation of the 12,000-square-kilometer (4,630-square-mile) Turubaxi-Téa Indigenous Territory in Amazonas state; some of Temer’s most environmentally damaging proposals failed to advance; infrastructure expansion in Brazil and neighboring countries got bogged down by corruption scandals and basic economics; indigenous communities won a series of legal victoriesand settlements against the state, and the headline deforestation rate in the Brazilian Amazon fell 16 percent versus last year. Indonesian rainforest. Photo for Mongabay by Rhett A. Butler. 2017 was an up and down year for Indonesia’s rainforests. Data released during the year showed that tree cover loss in Indonesia’s primary forests shot up in 2016 as a result of the 2015 fire crisis. And satellite data seems to suggest significant ongoing forest clearing into 2017, especially in Kalimantan and Papua. In an effort to avoid a repeat of past fire and haze crises, President Joko “Jokowi” Widodo issued several policies governing the management of peatlands, including a land-swap mechanism that allows companies to trade carbon-dense areas in their concessions for lands elsewhere as a means to reduce fire risk. Some of the regulations were struck down by the Supreme Court. His administration also announced a plan to reduce fires by half by 2019. Indonesia’s parliament, however, pushed legislation, including a major palm oil bill that could become law in 2018, that threatened to undermine those goals by loosening restrictions on plantation expansion. An analysis by the World Resources Institute (WRI) concluded that Indonesia is likely to miss its near-term climate targets. Central government agencies also sent mixed signals. For the Ministry of Environment and Forestry, 2017 was all about attempting to assert control. It stepped up prosecution of firms linked to illegal fires and peatlands clearance — including plantation giants Asia Pulp & Paper and APRIL — but also took measures against groups seeking greater transparency and accountability in the forestry sector. Greenpeace and Forest Watch Indonesia engaged in legal battles trying to get the Indonesian government to publicly release oil palm concession data. Plantation lobby groups — the Indonesian Palm Oil Association (GAPKI) and the Indonesian Association of Forestry Concessionaires (APHI) — asked the Constitutional Court to revise the national forestry law and environment law so they aren’t strictly liable for fires that occur in their concessions. Plantation companies have argued that fires within their concessions are often the result of burning by communities on adjacent lands. These fires can quickly spread in peatlands because drained peat is highly flammable. The Tapanuli orangutan (Pongo tapanuliensis) in Sumatra. Photo by Maxime Aliaga. 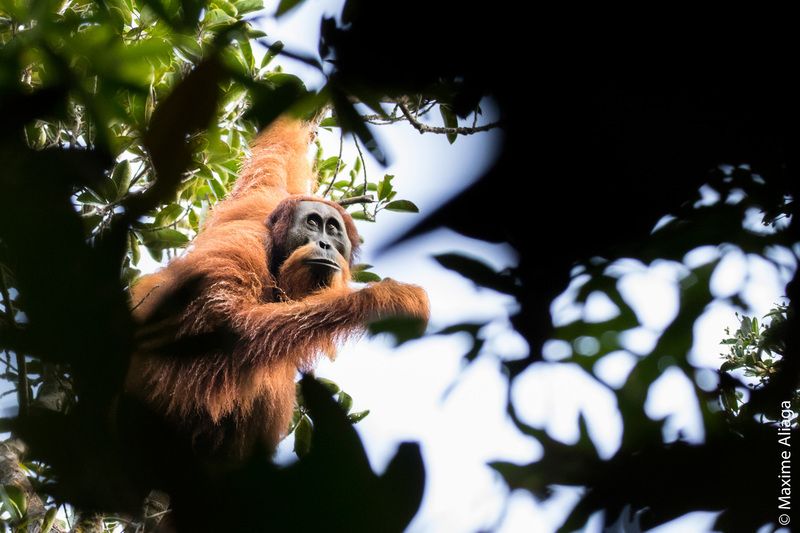 Scientists’ decision to classify a second species of Sumatran orangutan reignited global interest in saving Sumatra’s fast-dwindling forests. The Tapanuli orangutan is classified as critically endangered and is immediately threatened by a planned dam. Conservationists warned that proposed road projects pose additional threats to endemic species in Sumatra. One of those species, the Sumatran rhino, may be on the brink of extinction in the wild, with fewer than 100 — and possibly fewer than 30 — surviving outside captivity. Jokowi’s administration made slow progress in recognizing customary land rights per a landmark court decision in 2013. By November, the government had rezoned 164 square kilometers (63 square miles) as customary forests. The Indigenous Peoples Alliance of the Archipelago (AMAN) says that some 19,000 square kilometers (7,340 square miles)are immediately ready to be rezoned as customary forests. See Indonesia in 2017: A fighting chance for peat protection, but an infrastructure beatdown for indigenous communities for an in-depth look at other major environmental developments in Indonesia during 2017. Rainforest in Madagascar, which has experience an increase in its deforestation rate in recent years. Photo by Rhett A. Butler. Australia often ranks among the countries with the highest forest loss, but the revelation that deforestation has surged in Queensland was particularly concerning to environmentalists, given the uniqueness of the ecosystem and its proximity to the Great Barrier Reef. A government assessment found that 3,950 square kilometers (1,525 square miles) of tree cover was cleared in Queensland between 2015 and 2016, 40 percent of which occurred in the Great Barrier Reef catchment. A paper in Nature Ecology and Evolution argued that forest loss in tropical Africa has been greatly overestimated due to inaccurate assumptions about original land cover. According to the research, some of the areas classified as once having forest were actually savanna. 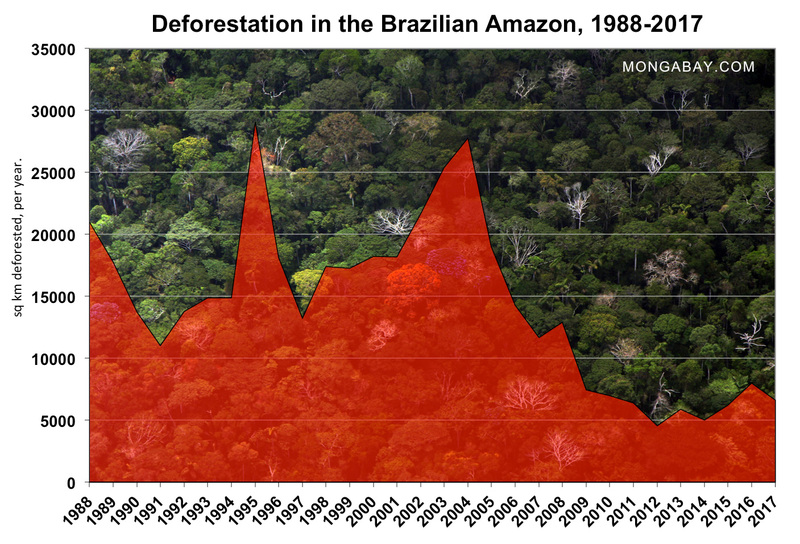 The study estimated forest loss in the region at just over 20 percent since 1900. That is roughly on par with the percentage loss in the Brazilian Amazon. A vast swamp in the heart of the Congo was determined to be the world’s largest tropical peatland. Estimated to cover 145,500 square kilometers (56,200 square miles), the peatland may hold more than 30 billion tons of carbon. Scientists made a case to governments that the area should be off-limits to logging and conversion for industrial agriculture. Myanmar’s national logging ban expired in March, although reports indicate that illegal logging persisted during the year-long moratorium. 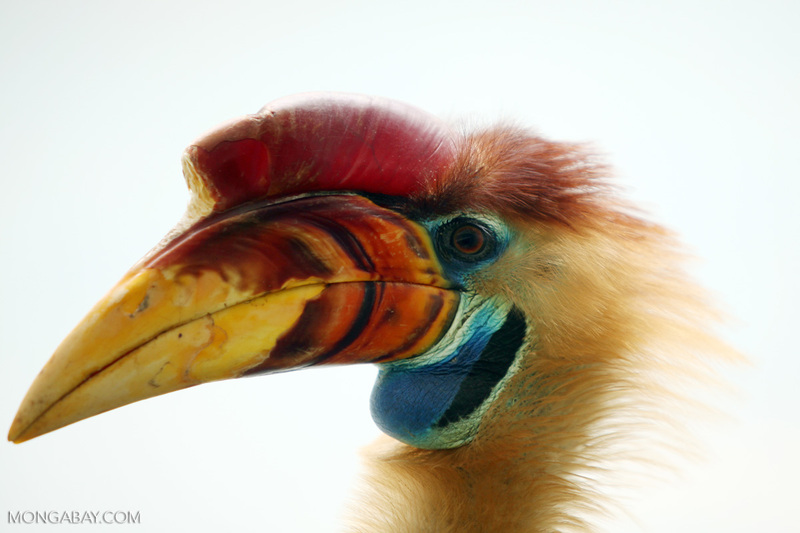 Please see Mongabay’s location feeds for news from more countries. 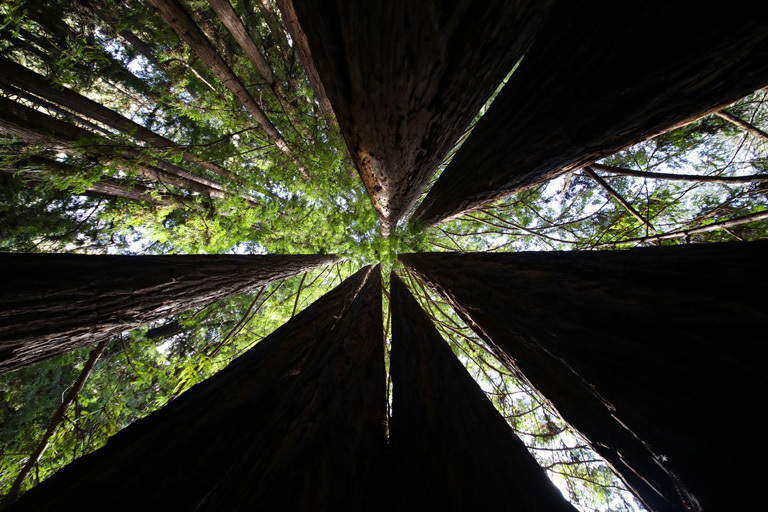 Redwood forest in Santa Cruz County, California. Photo by Rhett A. Butler. The Trump Administration‘s decision to pull out of the Paris climate agreement, weaken environmental and conservation regulations at home, and signal an intent to cut protections for wildlife abroad raised fears that important conservation programs and grants that benefit rainforests will be reduced or eliminated when they come up for renewal in 2018. Given that many of these are federal programs run under the State Department or Fish and Wildlife Service, it is unclear whether subnational jurisdictions like states and cities will step in to fill the gap. Plenty of important research on tropical forests was published in 2017. Here are a few highlights. A paper published in Science Advances assessed trends in intact forest landscapes (IFL), revealing that forest ecosystems greater than 500 square kilometers (190 square miles) in area and showing no signs of human impact declined more than 7 percent between 2000 and 2013. The rate of loss tripled in the tropics since the beginning of the study period. The research identified timber harvesting and agricultural expansion as the primary drivers of IFL loss. It seemed to suggest that timber certification seems to be contributing to IFL loss in the Congo Basin by opening up previously inaccessible areas to logging. A number of studies looked at the climate impacts of forest loss. A paper published in Environmental Research Letters assessed climate impacts of deforestation beyond releasing carbon dioxide, including methane and nitrous oxide emissions. The researchers estimated that tropical deforestation alone could cause a 1.5-degree Celsius (2.7-degree Fahrenheit) rise in global temperatures by 2100. 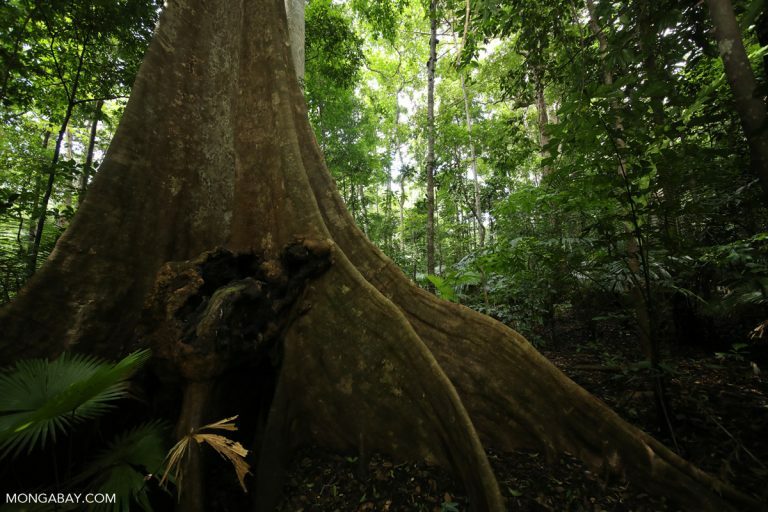 A Science paper concluded that tropical forests are now a net source of carbon emissions, with deforestation and forest degradation releasing more CO2 into the atmosphere on an annual basis than forests can sequester. The research — which used satellite imagery, airborne LiDAR systems, and field measurements — put net annual emissions at about 425 million tons. A study published in Environmental Research Letters added further evidence that deforestation is becoming more industrialized, with a growing proportion of forest clearing being classified as medium, large or very large, corresponding to the rise of plantations and industrial agriculture in the tropics. A study in Scientific Reports found that protected areas lost only 0.2 percent of their forest cover between 2000 and 2012. While that loss was low, it resulted in a disproportionate amount of carbon emissions because the protected areas had higher density of forest cover relative to unprotected forests. Nine percent of the reserves accounted for 80 percent of the emissions from protected forest loss. 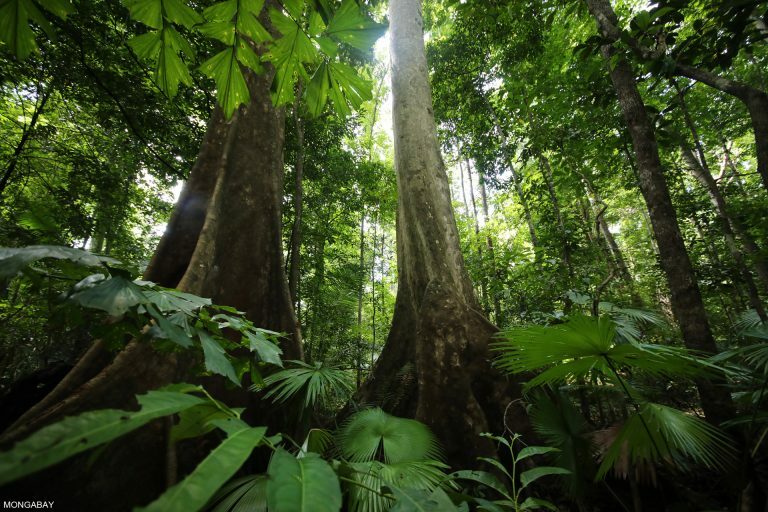 Emissions from tropical forest degradation are higher than emissions from outright deforestation in many countries, found a study published in Carbon Balance and Management. Forest degradation emissions were primarily from logging, fuelwood harvesting and forest fires. According to the paper, the countries with the highest forest degradation emissions are Indonesia, Brazil, India, Malaysia and the Philippines. The 2015-2016 drought in the Amazon rainforest produced the highest temperatures and extended to the largest area ever recorded in the region, said a study published in Scientific Reports. The research estimated that temperatures were some 1.5 degrees Celsius (2.7 degrees Fahrenheit) warmer than during the 1997-98 El Niño and extreme drought affected an area 20 percent larger than the previous record. A Nature Communications study estimated the extent of tropical forest fragmentation globally at 50 million fragments. The researchers argue that this fragmentation increases emissions from tropical deforestation by 31 percent. Yet another study warned about the potential adverse impacts of carbon-focused conservation policies on biodiversity. The Scientific Reports study found lack of correlation between tree biodiversity and carbon storage across different geographies. Environmentalists and biologists are highly concerned about plans to build nearly 300 dams in the Amazon basin. New research published in 2017 adds to the evidence that their fears are well-founded. A PLoS ONE study forecast the impacts of six dams planned in Peru and Bolivia. It found that the six dams would retain nearly 900 million tons of river sediment annually, preventing those nutrients from reaching floodplains, potentially affecting food security downstream. The authors also said the dams would generate 10 million tons of carbon emissions annually and worsen mercury pollution. A separate study, published in Remote Sensing Applications: Society and Environment, found that Brazilian mega-dams flooded far larger areas than projected in the dams’ environmental impact assessments, resulting in higher carbon emissions and economic losses. Planet, which operates a constellation of shoebox-sized satellites, was increasingly being used for forest research and monitoring applications. Groundwork began to be laid for a biodiversity-monitoring satellite mission that would use the chemical signatures of plants to discern species richness. The Monitoring of the Andean Amazon Project (MAAP) continued to produce impactful reports on forest change in Peru and neighboring countries using satellite data. Buttress roots of a rainforest tree in Sulawesi, Indonesia. Photo by Rhett A. Butler. Still more research was published in support of the argument that granting land titles to indigenous and local communities is an effective conservation strategy. A Proceedings of the National Academy of Sciences paper used remote sensing data to show that forest clearance and disturbance dropped sharply after the granting of land title to an indigenous community in Peru. Those findings were echoed more broadly in a Scientific Reports paper that found, on average, there was less deforestation and forest degradation in community-managed protected areas in the Peruvian Amazon than in those managed by the government. In recognition of the dividends of helping indigenous peoples and local communities in rural areas secure rights to their traditional lands, in October the Rights and Resources Initiative (RRI) announced the International Land and Forest Tenure Facility, a $100 million, fund for scaling up recognition of rights to collective lands and forests. The tenure facility aims to secure at least 400,000 square kilometers (154,400 square miles) of forests and rural lands for local and indigenous communities. A study published in PLoS Biology identified places where deforestation — and by extension, conservation — is most and least beneficial economically. It concluded that areas with high agricultural yields, low production costs and good access to markets — like the Atlantic Forest and the Gulfs of Guinea and Thailand — are places where conservation faces long odds in terms of economics. The research indicates that, overall, deforestation yields large net economic losses even once factoring in agricultural outputs. More academic papers added to the body of research showing the importance of protecting wildlife, including large-bodied birds and mammals, for maintaining forest carbon stocks. 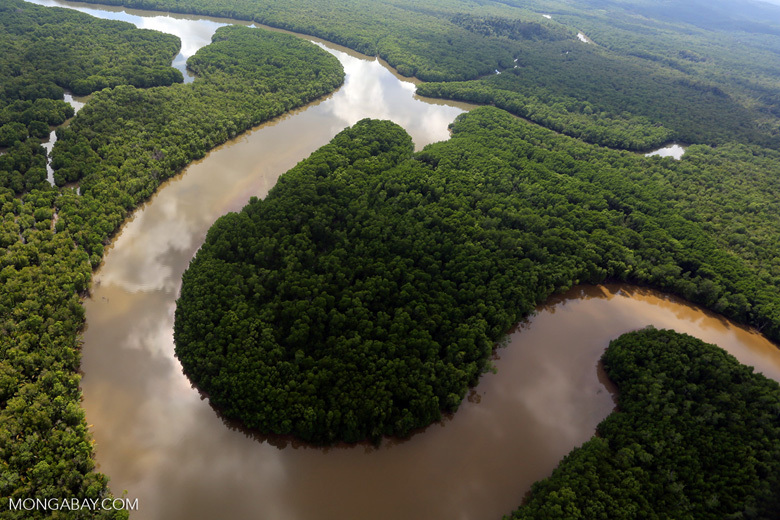 In Sabah, the eastern state in Malaysian Borneo, a plan to build a bridge over the Kinabatangan River near a wildlife sanctuary was canceled. Conservationists said the bridge would have disrupted wildlife migration in an area that has been hard hit by extensive conversion of forests to oil palm plantations. Sabah also set aside slated for logging as a conservation area. And the state began to work with a “wall-to-wall” map of its carbon stocks, the result of a mapping campaign initiated last year. Those maps will help identify what unprotected areas are most important for conservation in Sabah. 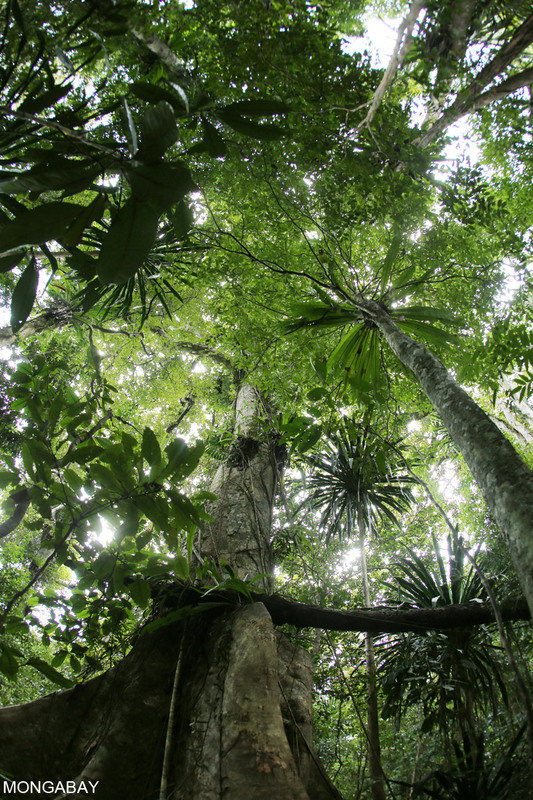 Norway continued to have an outsized role in tropical forest conservation efforts. In January, the Nordic country contributed $100 million toward a new fund that endeavors to support small farmers boost agricultural output while avoiding further deforestation and degradation. It later banned the public procurement and use of palm oil-based biofuel; hosted the Interfaith Rainforest Initiative to bring together faith leaders to build on the moral case for protecting tropical forests; and used diplomatic pressureto encourage Brazil to stand by its forest protection commitment. Papua New Guinea established its largest-ever conservation area after a 32-year process involving local communities and other stakeholders. Managalas Conservation Area covers 3,600 square kilometers (1,390 square miles). After a global outcry, Nigeria rerouted a super highway so that it would no longer cuts through the center of Cross River National Park, although concerns remained about the potential path of the road. Brazil: Watch for continuing fallout from the Lava Jato scandal, including impacts on large infrastructure projects that have involved corrupt dealings. Stripping corruption and contact-padding out of these deals, will make it harder to get big dams and roads financed. Indonesia: Sub-national and national elections are right around the corner. Typically politicians in Indonesia get their campaigns finances by granting plantation, timber and mining concessions, meaning that what happens in the run-up to an election can have significant implications for forests after the election. A major palm oil bill is currently working its way through parliament. 2018 isn’t expected to be an El Niño year, meaning fire risk should be lower than 2015-2016. United States: There is a great deal of uncertainty about what international conservation programs will proceed under the Trump administration. If the first year of the administration is any indication, there won’t be much leadership from the United States on conservation issues. Technology: Look for continuing advancements in satellite detection and analysis as well as on-the-ground sensor systems like camera traps. Artificial Intelligence (AI) is increasingly being applied to conservation challenges, and bioacoustics has huge potential to emerge as a good tool for biodiversity monitoring. Biodiversity: There’s a perception that biodiversity is losing out to climate in conservation policymaking, but in 2018 watch for a concerted push to get wildlife back on the public’s radar.